What if you want a lawn mower and you look at so many kinds and you cant decide? One lawn mower seems to have features that the one next to it does not. These is also the problem where your choice is starting to lean towards the mower on the right but theres that single feature that the one on the left has that you wish the one on the right has. You have to decide whether you want a mulching mower or do you want a grass catcher which you would have to empty. A mulching mower has its advantages but in some places, mulching may not be practical. Once you commit to the purchase of a lawnmower, thats what you will be taking home and you will see just how its working out as soon as you do your first few jobs. Buying 2 lawnmowers to solve your indecision sounds good but expensive. Well, the Snapper SPV21675 will come to your rescue. It can be a mulching mower or a grass catcher. It converts from bagging to mulching in a snap. Its great for all grass types. It has a unique Double Wave blade and height-of-cut control. It boasts a Briggs & Stratton engine and a 4.2 mph speed when this self-propelled machine does its thing. Its ReadyStart technology allows you to start the engine without the hassle of choke or priming. 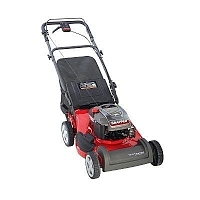 The Snapper SPV21675 wil definately make mowing your lawn a snap. Join in and write your own page! It's easy to do. How? Simply click here to return to Lawn Mower Consumer Reviews.